A few years ago I chatted with a Bushnell Golf sales rep about the company’s GPS watches. I asked him how accurate they were in measuring distances to the front, middle, and back of the greens. He said they were good to within two to three yards. I said that was far more accurate than I am. If they were that good I didn’t need to spend even more money on a laser rangefinder. Many golfers like me are perfectly satisfied with their GPS devices. When you add additional assistance features to a GPS watch, therefore, you should have a receptive audience. At the 2018 PGA Merchandise Show in Orlando, FL I met Gavin Dear, the chief commercial officer for Shot Scope, a Scottish tech company based in Edinburgh. He showed me their new V2 golf watch, which adds performance tracking to its GPS elements. The GPS part is essentially the same as other measuring devices, providing front/middle/back distances from anywhere on the course. Firmware updates added since the PGA Show also provide distances to the course hazards. In addition, Shot Scope’s V2 system comes with twenty small motion detector caps that screw into the grip ends of your golf clubs. Using the free app that comes with the $250 purchase, players download their courses into the system. The GPS wristband collects the swing data generated from the caps during the round, which is then downloaded to the app. Dear said the device can detect the difference between a waggle, a practice swing, and a real swing. After the round, players can review over 100 statistical elements, with the shots plotted on the course using the GPS data that was also collected. The data can be focused on the tee shots, approach shots to the green, short game results, and putting. Dear liked one particular stat called the Never Up Never In Percentage, which tracks exactly how short your putts are in approaching the hole. It might be a little embarrassing at first to look at these numbers, but improvement often requires a bracing splash of reality. The company’s website is up and running at shotscope.com. They also have a performance center in Chicago to help their North American clients with any issues. Dear sent me a V2 to test out, which I’ll be doing over the winter season and discuss in an upcoming column. This is the time of year that many golf course operators make decisions about equipment needs for the next season. Improvements in design and technology are among the factors that can lead to new investments. I met with Brandon Haddock of Cushman/EZGO at the 2018 PGA Merchandise Show and later in April at the company’s plant in Augusta, GA. In addition to golf carts, the Textron-owned companies build a wide variety of mobile equipment for golf course operations, including mowers and turf maintenance vehicles. Our chat in Orlando centered on two pieces that golfers could likely see on the course. Haddock first showed me the new Cushman 800 Hauler utility vehicle, aimed at course superintendents and their staff. The dashboards have been completely reconfigured to hold computer tablets and other devices, now often used as part of integrated irrigation control systems. Its 8.4 cubic foot cargo bed has high-walled sides, suitable for loose fill, fertilizer bags, or hand tools. The version I saw held a drop-in Refresher Unit, complete with ice holders, trays, and bins for cold drinks. The unit uses tie-downs to keep it in place, and melted water goes through the unit’s bottom to the cart’s drain spouts. 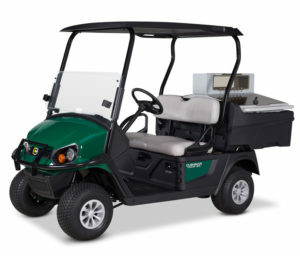 It looked like it would be a great supplemental food and beverage cart for larger-scale tournament events, with the removable unit making the vehicle available for other uses when not needed. The new golf cart models are also designed to handle advanced electronics. Several include screens that enable golfers to track their way through the course, as well as order food and beverages as they approach the clubhouse or halfway houses. The same devices permit the course operators to track the carts on the course using installed GPS units. They can also keep the carts on the course and away from hazards. For example, Haddock said the devices will slow down or even stop the carts in case they’re heading for a pond. 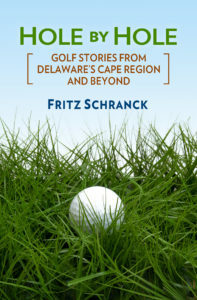 Screen-less versions can still provide operational controls needed by the course owners, at a lower cost. Haddock said all vehicles come with either gas or electric power options. He said the company is very pleased with the response to its new lithium battery power systems. The lithium batteries require far less recharging time, have a longer service life, and require far less operational maintenance than prior battery-powered vehicles.